Chief of operations on Deep Space 9. Friend of Julian. Father of Molly and Kirayoshi. Husband of Keiko. Likes kayaking, darts and historical battle simulations. Honor Transporter Skill Defense System Upgrade. Characteristics: "Here by Invitation"-related cards, "Reshape the Quadrant"-related cards, affiliation, any Miles, "Deep Space 9"-related personnel, matching commander, romantic partner. 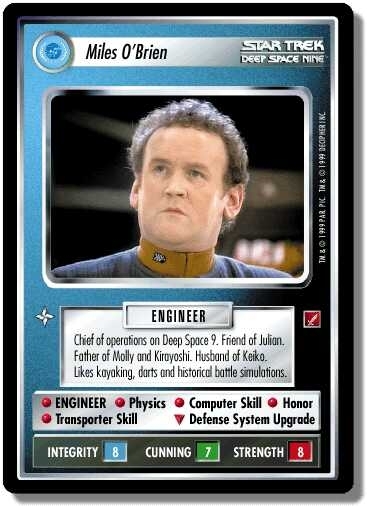 There are 30 entries for Miles O'Brien (ST1E 7 R 72) at the Tradeplace (24 haves and 18 wants). Click here to see all trade list entries for this Rare card!